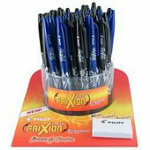 Black and Blue Frixion pen display. Includes test pad. 8.38" L x 6.63" W x 7" H. .07mm. Comes with 36 each of FX7BLK 12 each of FX7BLU. 48 pens total. Always test pens before use to be sure that the marks will completely disappear. May not be suitable for use with some dark fabrics or dyes, fiber contents, or fabric finishes.